Everyone remembers the most famous scene from Wayne’s World: the gang piled into a tiny hatchback screaming out the lyrics to Queen’s anthem, “Bohemian Rhapsody.” At my age, that kind of spiritual and emotional camaraderie among metalhead buddies is often a thing of the past. Whether your friends are investment bankers, still doing “the music thing,” just married, or all of the above…when you get older, there’s just less time for pounding beers, driving around and singing along to rockin’ anthems. Thus, you’re left alone to harmonize and play air guitar and drums along with Night Demon. Which, frankly, is quite fun. The band’s sound hearkens back to metal’s ’80s glory days, combining elements of NWOBHM, Big Four-era thrash, and more classic influences like Black Sabbath and Thin Lizzy. Bassist and vocalist Jarvis Leatherby crafts catchy, almost bluesy melodies while summoning Iron Maiden with his bass lines. Guitarist Brent Woodward plays solid, powerful riffs and drummer Dusty Squires bangs out bouncy, swinging beats. It’s the combination of all of these different sounds—along with a bit of a gruffer, ’90s-style influence in the vocals—that makes this album so timeless, appropriate and catchy. 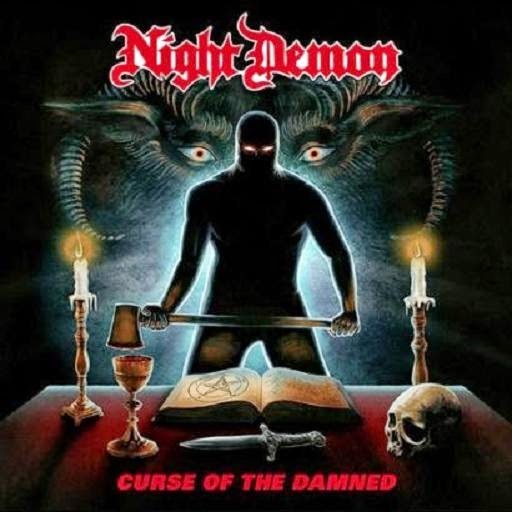 Curse of the Damned opens with one of the strongest tracks, “Screams in the Night.” This song probably best exemplifies all of the aforementioned influences and also highlights the band’s bluesy side. A couple of songs later, we get another favorite, “Satan.” This terrific, plodding anthem pits listeners against the ruler of the underworld, complete with musical pace changes and a nice overlaying vocal performance from Leatherby. But “The Howling Man” is probably the most ambitious thing here; at over six minutes in length—and featuring an intro of thunder, fire, rain and, later, howling wolves—the song bleeds into a muted riff and a driving beat, replete with rhythm changes and modulations for the guitar solos. Things continue very much in this pattern, so I’ll spare you a song-by-song review. But by the end of the album, as “Save Me Now” fades out to some very awesome, chorus and reverb riddled harmonies, the band’s really brought this thing home. I’d been anxious to hear Curse of the Damned ever since the band unveiled the album artwork, and the album definitely didn’t let me down. It’s a stellar debut LP from this very promising trio. With a little production help and a bit more diversity in the songwriting going forward, these guys could really end up stealing our metal hearts and souls. Curse of the Damned is out now on Century Media Records. For more on Night Demon, visit the band’s official website. Next Article Quickies: Blind Guardian gets a bassist, Geezer Butler gets an arrest record, and more!